At a dinner at the Birlings’ home in 1912, Arthur Birling, a wealthy mill owner and local politician, and his family are celebrating the engagement of daughter Sheila to Gerald Croft, son of a competitor of Birling’s. In attendance are Sybil Birling, Arthur’s wife and Sheila and Eric’s mother, and Eric Birling, Sheila’s younger brother, who has a drinking problem that is discreetly ignored. 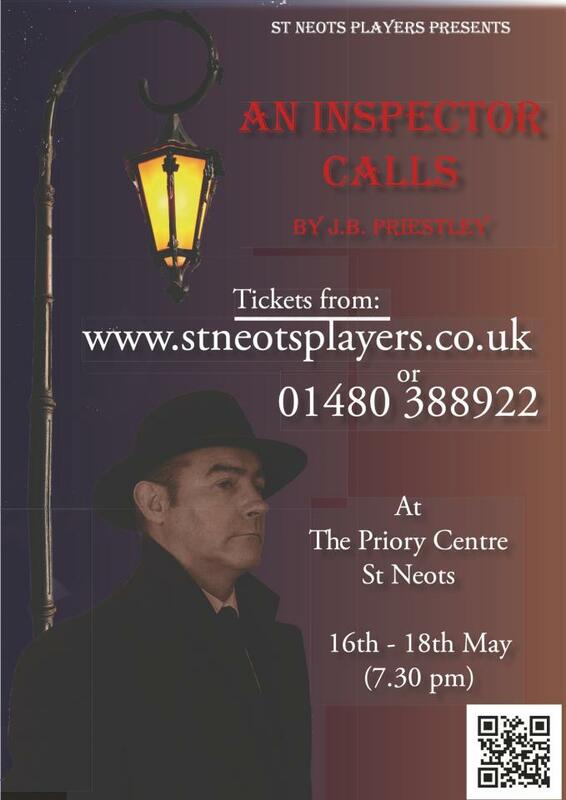 An ‘Inspector Goole’ arrives and explains that a woman called Eva Smith killed herself by drinking strong disinfectant. He implies that she has left a diary naming names, including members of the Billing family. During the course of the evening the Inspector interviews each member of the family in turn and reveals their relationship with the dead woman and how they have contributed to her untimely demise. But all is not what it appears and the play’s ending presents one of the great twists of 20th century theatre. 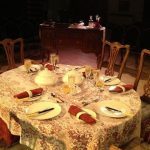 This play is a timeless classic by J.B. Priestley, a socialist reformer who often uses his plays to promote his views on social and class reforms. 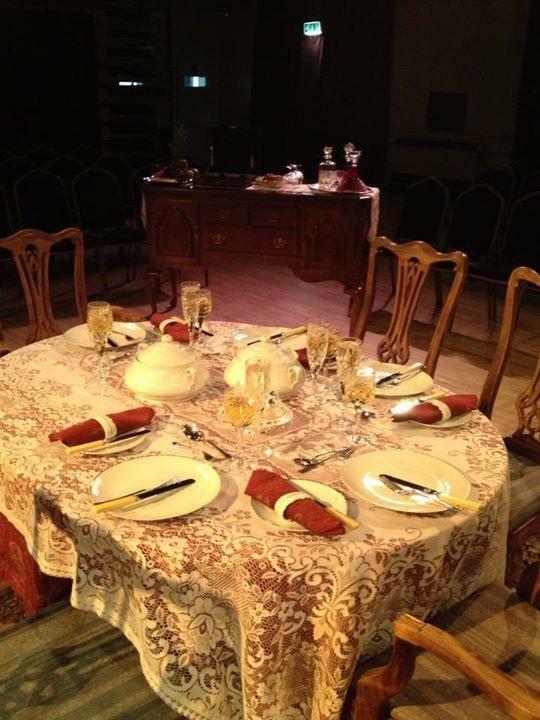 J B Priestley’s play, first premiered in Moscow, is considered a classic of English theatre. It has been hailed as a scathing critique of Edwardian society and as an expression of Priestley’s Socialist political principles. This three act drama takes place on a single night in the prosperous home of the wealthy mill owner Arthur Birling. Maxine bravely set the performance in the round. Thus the audience almost became part of the action or at least silent witnesses to the events as they unfolded. The setting was excellent with all the trappings of a family celebration, the silver and glass glittered so that the scene was vividly set. Movement around the table and the room was well directed throughout. Care was taken to ensure the audience’s view was not hindered unnecessarily. However the volume and diction of the actors, particularly when they had their backs to the audience, should be monitored carefully. Some volume was lost at the beginning of Act One and at other times during the play. Don McKay as Arthur Birling was entirely convincing as a representative of the capitalist ruling class and head of the family. This was a strong performance that grew in stature as the play progressed. Don gave us a man who has ‘made his own way’ and his arrogance, self conceit and need to maintain his social standing, drove the plot. Christine Suggars was effective as Sybil Birling, demonstrating her social and moral superiority. Some of her lines were lost when she had her back to the audience however and faster cueing would have given her performance more energy. Abbie Miles as Sheila Birling was very believable. Unlike her father, Arthur, Sheila undergoes a radical change, her social conscience has been awakened and she is now very aware of her responsibilities. Abbie’s strong performance demonstrated these changes perfectly. Her emotional upheaval with Gerald was also very convincing. James Walters’ performance as Eric Birling was thoroughly believable too. Eric is a young man about town with a drink problem, who is often belligerent at home much to the annoyance of his parents. He too undergoes a significant change. James captured this transformation well and like his sister, accepted his responsibility. Both Abbie and James were able to reveal the development of their respective characters which ultimately would bring them into conflict with the prejudices of their parents. Sean Webb as Gerald Croft was another convincing performance. Sean has an excellent speaking voice. In Act Three he was especially good at raising doubts about the Inspector and celebrating his perspicacity only to have it destroyed later. Finally Simon Ockenden as the mysterious Inspector Goole, gave a finely tuned performance. At times sympathetic to the Birling family, then threatening. Simon commanded the stage appearing to know everything about the family’s involvement with the dead girl yet his questioning was aimed solely at getting them to reveal their guilt. His performance built up to a powerful frightening conclusion when he says humanity will learn its lesson in ‘fire, blood and anguish’. The end of the play came with a telephone call about a dead girl. This final act was gripping as the plot changed. We were left wondering who Goole was, an avenging angel, or a warning. Maxine had directed this with care and put much thought into the movement and dynamics of the characters. The family celebration in Act One set the scene well although I would have liked to have seen more jollity and exuberance as a contrast to what was to come. The tension was built up throughout the play and each denouement carefully plotted. The twists in plot in Act Three were well directed and left the audience wondering what had happened. This was a very successful production which brought out clearly and dramatically Priestley’s judgement on the hypocrisy of Edwardian society.